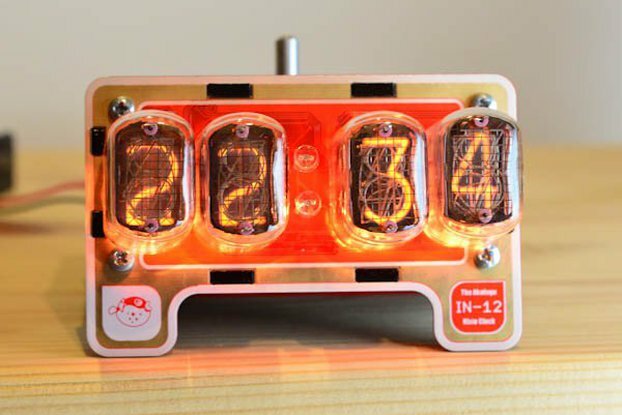 Our IV-11 VFD Nixie Tube Clock come with 100% authentic brand new IV-11 VFD tube made in USSR between 1980s-1990s and are out of production. 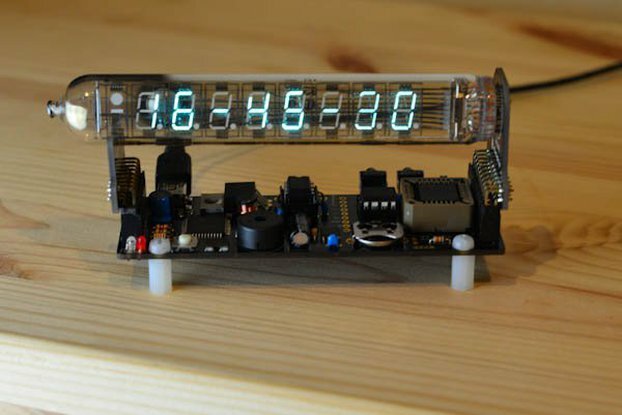 Vacuum Fluorescent Display technology or VFD in short, was invented in 1950s and it has since evolved over time from Vacuum tube indicators to Digital Digit Display in 1962. VFD technology is still used in many applications today, but not in the appearance of a tube. The VFD we see today are flat and because VFD display does not require back light, is able to constantly display in high brightness, digits can be displayed in several colors, content is highly customizable, VFD technology is still the preferred display medium today; VFD displays can be found in automotive, high-end instrumentation, Hi-Fi devices and intelligent terminal, such as our car audio display, Blu-ray player, desktop multi-meter, supermarket cash register, etc. VFD tubes contain phosphor coated anode that is bombarded by electrons emitted from the filament, and can come in different colors. 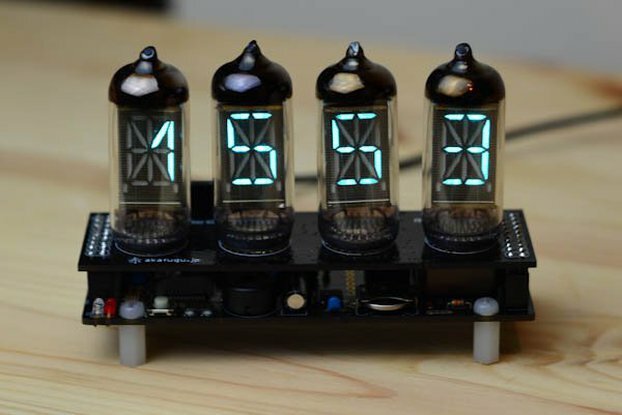 VFD tubes unlike Nixie tubes, do not produce heat during operation. Our tubes are 100% authentic brand new IV-11 VFD tube made in USSR between 1980s-1990s and are out of production. The glass body is cylindrical with 22.5mm diameter, side display, 11 fly pins (8 anodes corresponding to 7 segments and 1 decimal point, 1 grid pin, and 2 filament pins). The base housing is made with real hard wood frame for stability and character; and laser-cut black opaque acrylic for the top and bottom cover to effectively bring out the glow from the tubes and LED. The base houses the gold plated PCB, and RGB LED Back Light. The VFD Tube Clock functions are manually adjusted using the provided infra-red remote control. If you prefer automatic tracking of local time, the GPS receiver can be plugged in with the additional ports provided in the wooden frame. Optional thermometer can be connected to the additional port in the wooden frame should you wish to include temperature reading function and display. A semiconductor ambient light sensor (not photosensitive resistor) is added in to automatically control the digit and back-light brightness according to the ambient brightness. A fully assembled IV-11 clock, ready to use out of box. 1 x Power adapter (world wide use voltage). 1 set wooden & acrylic housing, including all spacers and screws. All components, ICs, MCU have been programmed. 1 x gold plating PCB board. 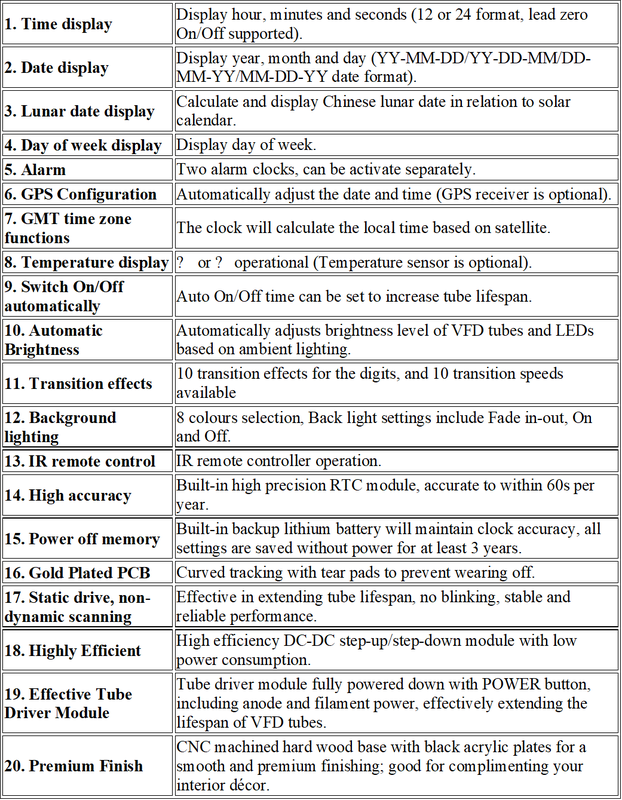 FOR MORE INFORMATION ON TECHNICAL SPECIFICATIONS AND FEATURES, PLEASE REFER TO DATA FILES.